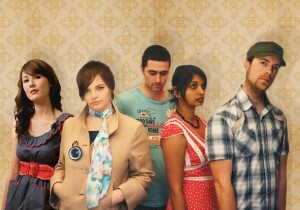 Up-and-coming indie darlings, Skipping Girl Vinegar, are one of Australia’s most talked about bands. Childhood friends and celebrated songwriters, they have released two critically acclaimed albums in their homeland, Sift the Noise and Keep Calm, Carry the Monkey that made many ‘Album of the year’ lists. Both albums have received extensive radio play on national Australian youth network Triple J and championed by ABC and major alternative radio nationwide. Where hi-fi swagger meets low-fi sway, Skipping Girl Vinegar have carved out their own heart-warming, hobo-pop sound that is testament to the band’s old-world authenticity and song craft. Skipping Girl Vinegar release their Chase the Sun EP into the USA on the 25th of June that hints at whats to come from their critically acclaimed album Keep Calm Carry the Monkey due for release into the USA later this year. Skipping Girl Vinegar has played many of Australia’s premier festivals including packed shows at Splendour In The Grass, The Falls Festival, Woodford Folk Festival, Sunset Sounds, Pyramid Rock, Port Fairy Folk Festival. SGV have also supported the likes of The Lemonheads, Something for Kate, Shout Out Louds, Missy Higgins, Angus & Julia Stone. SGV have performed numerous times on national television and their film clips have received critical acclaim (Including 5 times ‘Indie Clip Of The Week’ on Australia’s premier TV program RAGE). Recently charting on the U.S. CMJ charts with their ‘Chase The Sun’ EP (2012), the band have been invited to play the CMJ Music Festival in New York in October this year alongside showcases in Los Angeles & Nashville. Whilst in the U.S. Skipping Girl Vinegar begin recording their third album with legendary producer Brad Jones (Josh Rouse, Missy Higgins) and release their Keep Calm, Carry the Monkey LP into the U.S (Mon, 22nd October 2012). The band name, Skipping Girl Vinegar, comes from one of Australia’s first and most beloved 1920’s moving neon signs of a skipping girl, in their hometown of Melbourne; advertising a now defunct vinegar company. Skipping Girl Vinegar has carved out their own heart-warming, hobo-pop sound that is testament to the band’s old-world authenticity and song craft. The character of the album was built around found objects discarded in dumpsters; breathing new life into them with all their beautiful, dysfunctional qualities. “Don’t be afraid to limp in public” was the advice given to Skipping Girl Vinegar’s lead singer and celebrated songwriter Mark Lang by music veteran Ben Harper, when both on the bill at Australian premier music festival Splendour In The Grass. According to Mark, “This advice gave me the confidence to explore outside of our comfort-zone and search to make something fresh when people are watching what you do next. We had already begun working on the new album and had decided not to make Sift the Noise, volume two. We pushed ourselves – questioning our known process, breaking down everything we did, trying to find new pathways in our writing and recording. This makes you feel extremely uncomfortable and can leave you feeling like you are floating in nowhere land. The temptation to return to what we knew was strong but I’m glad we pushed ahead into the unknown to unravel a new direction,” says Mark Lang. If you take the time to explore the cover art you will see that Skipping Girl Vinegar are not your average collective. With a scrupulous eye for detail and an understanding of human connection, the album artwork is like a whisper that draws you close to see and hear the layers and textures of hidden details and thought. Through photos, cut outs and embossed files, the design reinforces the textured feel of the album. Skipping Girl Vinegar were offered significant six-figure major label world-wide offers in Australia for their debut album but made the decision to maintain independence in their homeland and find individual label partners in other territories. The band make their maiden U.S. trip, this October, showcasing Keep Calm, Carry The Monkey to potential U.S industry partners. Keep Calm, Carry The Monkey was written across two continents and recorded on the Victorian coast, mixed in Nashville by legendary indie engineer Brad Jones (Josh Rouse) and produced by Melbourne indie-wiz Nick Huggins [Kid Sam, Whitley], Caleb James [Yves Klein Blue], Greg Arnold [Stonefield] and SGV’s Mark Lang. Rich with sonic landscapes, melodies and lyrical turns the album proudly closes with a special guest performance from legendary singer/songwriter Ron Sexsmith (Canada).